Locality in Spain, not far from Najera, with a famous convent of great antiquity. Jews were living here as early as at Najera, and they suffered greatly in the civil war between D. Pedro and D. Henry de Trastamara. 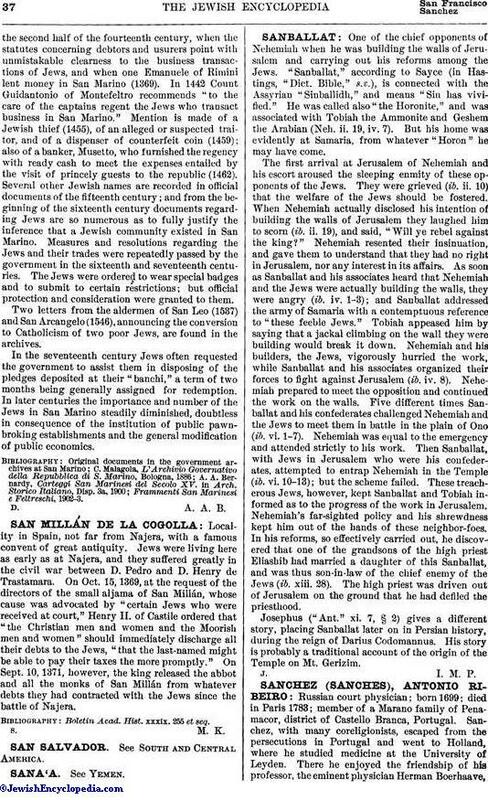 On Oct. 15, 1369, at the request of the directors of the small aljama of San Millán, whose cause was advocated by "certain Jews who were received at court," Henry II. of Castile ordered that "the Christian men and women and the Moorish men and women" should immediately discharge all their debts to the Jews, "that the last-named might be able to pay their taxes the more promptly." On Sept. 10, 1371, however, the king released the abbot and all the monks of San Millán from whatever debts they had contracted with the Jews since the battle of Najera. Boletin Acad. Hist. xxxix. 255 et seq.